*This is the first part of a longer essay I am writing on school shootings. I’ve attached citations below in case you care further any of your own reading. I grew up in the state of Colorado. It’s known for cowboys, mountains, skiing, the Broncos, (and now) the legalization of marijuana, but also—school shootings. Since the shooting at Seattle Pacific University in the beginning of June my connection to mass murder and school shootings has become all-too-familiar. My younger brother is a freshman at Seattle Pacific University where a 26 year old with a shotgun recently killed one and injured three others in the latest school shooting. My brother is finishing up his first year of school as a music major before moving to Santa Cruz in the summer to work as Christian summer camp counselor. While untouched by the damage to the shooter, another young man on the same dorm floor as him, Paul Lee, was not so fortunate. He was taken to the hospital where he was pronounced dead (three other wounded victims survived). Though the body count was considerably less than recent events at Santa Barbara, its timing mirrors the increasing normality with which such shootings are now taking place. My brother and I grew up with guns in the town of Bailey, Colorado. It’s a small mountain town about an hour southwest of Denver. 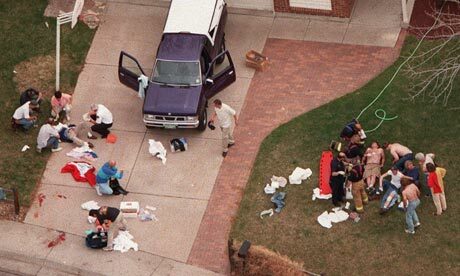 It’s a mere forty minutes away from the suburb of Littleton and Columbine High, the now infamous site of the first mass school shooting that really rocked the American psyche. One of the families who lost a son in the Columbine shootings attended our church for a couple years. Then there was the Aurora movie theater shootings where a man by the name of James Holmes killed 12 people at a midnight showing of The Dark Knight Rises. I used to go to Aurora in high school to watch movies in one of the state’s last drive-in theaters. Bailey is a strange mixture of rednecks, conservative Christians, new age folks, commuters, hippies, outdoor enthusiasts, and undeniably proud gun owners. My dad was a hunter and kept a rifle beneath his bed (which he made out of Aspen trees he chopped, stripped, and stained himself.) Every October he would take a week off work and go into the mountains with some friends to go hunt. He’d usually come back with a deer or elk and our family would stock our freezer full of fresh deer and elk. My dad was never a huge hunter—I think more than anything he liked getting out into the woods and hanging out with a group of guys in the fresh mountain air. Growing up I never had a problem with guns. They were a tool. Like a knife or a hatchet. We had an old antique gun that hung above the doorframe to the right of our black woodstove. People are proud of the second amendment right in Bailey. A lot of them hunters. A common refrain heard around town (in the case of shootings) is that if only more people had guns we could curb the gun violence done by others. The only thing that stops a bad person with a gun is a good person with a gun. People would say that in countries where more guns exist there are less acts of violence. People would say that mass shooting are sensationalized by the media and other homicides, involving knives or other objects, are never mentioned. These were the ideas I was grew up with. As I was to find out later though, the facts of gun control were increasingly more convoluted than perhaps either “side” would like to believe. In 2006 a drifter by the name of Duane Morrison walked into our local high school (Platte Canyon High) and barricaded six girls into a classroom. He sexually harassed some of them before a SWAT team arrived and entered into negotiations with Morrison, enabling five of the six girls to escape unharmed (at least physically). Morrison shot the other girl, then himself. Her name was Emily Keyes. Same grade as my sister. The SWAT team, by all accounts, did a terrific job. My sister, as God or luck would have it, was coincidentally not there but on a filed trip, although one of her best friends ended up in the same barricaded room as Keyes. I was in college. My little brother was evacuated from the adjacent middle school. I’d like to think that I am the only one with a brother or loved one who has witnessed multiple shootings, but I doubt it. In fact, I bet my connections to multiple school shootings are weaker than most. Still the question remains: if we as thinking, feeling human beings wish to seek life and prosperity of our brothers and sisters (both literal and figurative) what are we to do? The issue retains complexity without a doubt. Gun violence is in the triptych of American controversy along with abortion and gay marriage. Some regulation? Probably. Yet it seems the results are mixed in Australia where since 1996 the country has enforced a strict gun control policy, as well as a buyback program, to curb gun violence. However, there’s still gun violence—armed robberies and such. Even so there has not been a mass shooting in Australia since 1996. Part of the problem could be with just how big America is, interlacing the rural with the urban, the federal with the state. Mental illness? For sure. Quite some years ago Ronald Reagan implemented a proposal to move the mentally ill residents of infirmaries from cruel and unfair treatment asylums (think One Flew Over the Cuckoo’s Nest) to more community based care support services. The idea was fine. The implementation—not so much. The community based care services were attempted but never fully followed through with, transitioning America (with the help of the Vietnam War) from a place with a few drunks on the street to cities overflowing with veterans and sufferers of mental illness—the now homeless. Couple poor mental health policy with little gun regulation and you have a serious problem. Currently guns account for 67.8% of all homicides, as reported by the “Crime in the U.S.” section of the F.B.I.’s website (knives or other cutting instruments account for 13%, personal weapons (like fists) 5%, blunt objects 3% and “other” dangerous weapons 9%. Many gun related homicides are gang related (though less than what some claim, perhaps 12% of homicides) and 60% are suicides. In general, violent crime by guns is down and, perhaps even more disturbing, most of the guns obtained by perpetrators of mass shootings obtained their weapons legally. Mass shootings are undeniably a tragedy but they do make up a relatively small percentage of over all gun deaths. Cities such as L.A., Chicago, Long Beach, and Newark all have high homicide rates and gang deaths, but we don’t hear about these as often. They are the norm, as with, say, wars in the Middle East. It seems as if death by mass shootings is simply becoming the new norm. The Onion, after the Santa Barbara shootings, offered the chilling headline which read, “‘No Way to Prevent This’ Says Only Nation Where This Regularly Happens,” succinctly commenting on a sense of American apathy with just what the hell to do about school shootings. What are the answers? More guns? Less guns? Mental health policy? An article in the Washington Post looking at findings by Everytown (a gun control advocacy group) recently pointed out that there have been 74 school shootings since Newton. However, as some folks were quick to point out, many of these were not active school shootings situations but included disputes, suicides, etc. Even so, mass shootings (often done at schools) are clearly on the rise . The six deadliest shootings in American history have happened since 2007.Thus begging the question: are school/mass shootings the new form of modern death? Is this merely the modern reincarnation of death by war or tribe or gang? Do schools now join the infamous ranks of Compton, Chicago, Syria, Vietnam etc. Is this merely the new face of death and mass murder? Seattle sticks out to me because of my brother, but also because it was so close to the previous Santa Barbara shooting, June 5th (13 days to be exact.) Yet only five days later there was another shooting in Troutdale, Oregon on June 10th, making it the fourth multiple shooting event in six days. Both have already made less headlines (and for understandable reasons). However, it will undoubtedly be THE headline of students, parents, and family members involved for the next few months and probably years, hell, the rest of their life. Mass shootings seem to be a decidedly modern, Western, and even more so, American problem. Or perhaps one could say, mass shootings at the hands of America males with a history of psychosis and access to guns. However you want to define it, gun deaths are a sordid issue rooted in complexity. Unlike what many political pundits or talking heads might say there are always multiple issues at hand, a combination of factors that leave the loved ones to grieve the dead and the rest of us debate. Are the Readers of Christian Books (or Books in General) Naturally Assumed to be White, Middle Class? The other day I found myself reading one of the many Christian books I occasionally find myself flipping through (I italicize Christian not to imply that the books themselves are Christian, but to emphasize the genre of book that I was reading) when I noticed some language that made me a bit uncomfortable. Nothing theologically heinous or sexist or racist or even political, rather it was an assumption inherent in the text. The assumption was that whoever was reading this was from an upper-middle class background, probably white. The examples, lingo, and ways of communication were clearly directed at someone who was educated, wealthy, and had time to spare reading. Then I realized that it wasn’t this specific book as much as it was the majority of books I had read about the Christian life or Christian experience (or was it just plain old “books” in general?) I’m not blaming the books or even the authors. I merely find it interesting that there is perhaps a much more specific target audience in mind that I had never thought of because I am, surprise, middle class. More lower middle class, like still-shop-generics-middle class and going-out-to-eat-is-going-to-a-taco-cart-middle class, but still middle class enough that I had never paused to think about it. These are not bad questions or assumptions. The author could be implying that since this book is written in English there’s a good chance you are part of the Western world, specifically America, and therefore really are wealthier than three-quarters of the world. But if not, there seems to be a subtle, although perhaps staggering assumption, that the person reading this is doing so in the comfort of their nice home and not on the “other” side of town where the poor people are. You’re obviously well educated, and make decent money at your job, more decent than most that you fall into the temptation of putting too much emphasis on your career and/or money. The questions, examples, and lingo aren’t exactly targeted towards working class, blue-collar folk, from certain regions of town. Even books that make a plea for social justice, simple living, and as hippie as you can get, are still assuming that you are not some anarchist living in a house with ten people and chickens in the back. The question I have is if this is the natural, yet targeted conversation of non-fiction books in general, or if it relates specifically to “Christian” books? If it is more specific in a religious sense I find this very disturbing. Of course “books” are targeted to a more educated crowd of people who also like “books,” and written by people who also presumably read other “books.” Yet, I can’t help but feel rubbed the wrong way when a book tends to explicitly assume your background. This was brought to my intention while going through such a Christian book when a woman in our house church, who came from a Cambodian/El Salvadorian family, remarked that she couldn’t really understand any of the examples the author of a certain book used to illustrate her/her points. Some example about how the author learned to “trust in God” and “have patience” after spending lots of money on her kids birthday to only have the cake decorations ruined. It was something trivial, obviously a hyperbolic example, but undoubtedly an example of a certain demographic. This woman in our house church wasn’t angry or anything but she said she really just couldn’t relate to any point the author tried to put across. Am I splitting hairs? Is this a waste of your time? Probably. Still I haven’t seen a book that references poverty without it being the assumption that since you are reading this book you are not poor. All books on poverty are about helping “those” people. Even if the book does remind you that you are no different, you are still the one reading the book. Is this to be expected? Now, there’s an obvious reason for this and one that puts all unnecessary logic and thinking to shame, which is the simple fact that educated people tend to read more than un-educated people. I’m not trying to be classist, but I think data would back me up. People who have an education and are not a working single mom with two kids tend to have more time and energy to read books about their own self-improvement, spiritual or otherwise. Am I contradicting myself by getting mad at people who assume we’re all rich when I am in fact claiming that only educated people read? Probably. Perhaps we could say that most non-fiction books of a certain caliber are created for people of an educated demographic. I would just find it troubling if so called “Christian” books made the assumption and marketed accordingly, especially since the Christian faith should supposedly (supposedly) be one of the places in the world where grace and love trump class and race and we are all sisters and brothers. For it seems that we can care about the “poor” through physical needs and yet assume they would not read the same books as us? Because they are poor? Or because we are self-righteous? Or is it another example of the divide of class and race that plagues not only Christians but all of America? I just found it disturbing to be reading a book and have the author assume that because they were from a certain background I was too.